That moment when you drop your phone and everything stops. You can hear your heart beat — the buzz of the world around you is silenced — all cognition stops — you see as if in slow motion the pirouette of your $700 piece of electronics toward the cement. How will it land? Will you get lucky this time? Or is this it? But if you had this case on it, you’d then see it spring horns and land with a jaunty bounce. 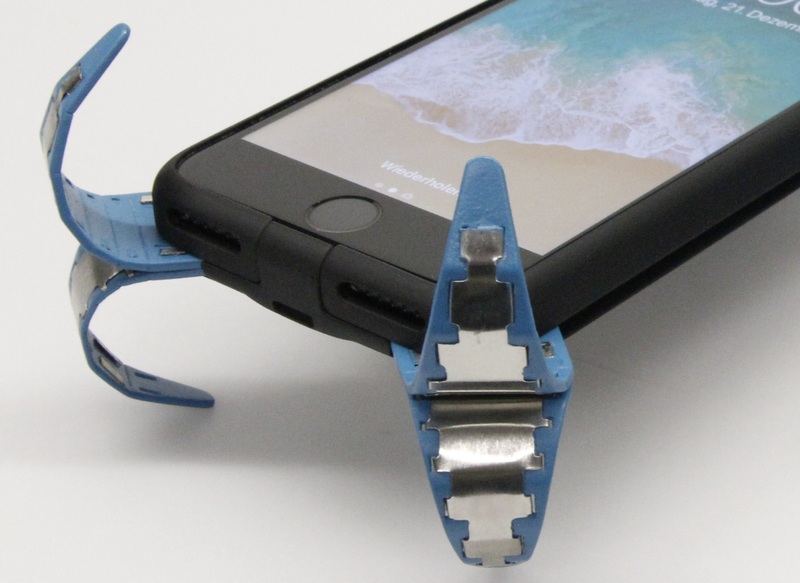 This “active damping” case, a bit like an airbag for your phone, is the brainchild of Philip Frenzel, an engineer at Aalen University in Germany. His idea won the top award from the German Society for Mechatronics, which considered projects from students all over the country, and you can see him explain its genesis in a video here. Frenzel, like me, doesn’t like compromising his phone’s aesthetic with some ugly protective shell, but he likes even less the shattered countenance that inevitably results from this aesthetic decision. Why not something that only deploys when the phone is in danger, then? He got to work. The activation mechanism he arrived at early: sensors that detect when the phone is in free fall and activate the next step. But what was that step? In his tinkering, he initially thought of installing an actual airbag mechanism on the phone. But that, and a foam-based alternative, and a few others, simply didn’t prove practical. Finally inspiration struck. Instead of something soft, why not something springy? Perhaps… springs. As you see above, what he arrived at is a set of eight thin metal curls that normally lie flat inside the case. But when released, they pop out and curl up, protecting the edges of the phone from impact and softening the blow considerably compared with a full stop on the concrete. When you pick up your (hopefully undamaged) phone, you simply fold the springs back into their holsters, priming them for their next deployment. Of course, there’s the consideration that having these things deploy while the phone is still in your pocket would be at best embarrassing and at worst rather painful. One assumes there are considerations in place for that — tapping into the phone’s proximity sensor, for instance, to see if it’s in a pocket or bag. Frenzel has already applied for a patent, and even printed T-shirts with a catchy logo. So this thing is practically for sale. Next stop: Kickstarter.